The Grand Prix concluded this week with NHK Trophy. And what an event it was! There was a good pairs competition …. And then there was Yuzuru Hanyu’s world-record-shattering performance in the men’s event, which was the highlight of the season so far and will be remembered for many years to come. I know this is a pairs review, not a men’s review. But before we get into pairs, I have to take a moment to bow to the genius of Yuzuru Hanyu at NHK. It was so great, it dwarfed everything else that happened in Nagano. Has there ever been a brighter star, a more exceptional talent, in figure skating than Yuzuru Hanyu? I don’t think I’ve ever seen one. Physically, Hanyu is gifted with preternatural jumping ability and wondrous speed. But what truly sets him apart is what lies within: His competitive nature and his innate musicality. I’ve never seen a skater who has won so much, yet is still so hungry for more. It’s as if his Olympic gold never happened. Each time Hanyu steps on the ice, it’s like the first time: He is driven to show us once again how good he is, how much he deserves to be #1. And why is he so good? For me, it’s not only the jumps but also his exceptional musicality. Hanyu is not, and will never be, that skater who neatly hits each beat of the music, or who has the most perfect carriage or classic positions. And yet, his feeling for the flow and the intent of music is extraordinary. What he does so well is make you feel the highs and lows and movement of the music—the inherent drama of each piece. He is always alert, intelligent, aware in his skating. And, of course, he’s an incredible athlete. During the Olympic season, I thought to myself, “Maybe one day, Hanyu will go over 300 points.” But I never expected anything like the 322.40 he posted at NHK. It’s an achievement for the ages. NHK pairs champion Meagan Duhamel tweeted: “Yuzu’s program at NHK15 is the best thing that I’ve ever seen in figure skating. In 20 years people will be talking about this performance.” Who knows, maybe Meagan will be inspired by Yuzu’s skate next month when she appears at the GP Final! 🙂 Certainly, he is an inspiration and ideal for skaters everywhere. Now, on to the pairs event at NHK. The last pairs event of the GP series was similar to the first one at Skate America. We saw quite a few good short programs at this competition, but once again the performance level fell off a bit in the long programs. Meagan/Eric easily won this event with a 10-point lead. However, they had some uncharacteristic mistakes in both programs. Their short program to “Your Song” was good, but not great. Their SBS 3Lz was not as close together as usual, and Eric put a hand down. Also, the landing of the throw triple Lutz was a bit sticky. Their musical expression in this program felt a bit forced to me—not as easy and flowing as at Skate Canada. But they still scored 71.04 for 1st. Meagan/Eric felt a bit off in their Hometown Glory LP. They opened with a very nice triple twist that earned as high as +3, and the following SBS 3Lz was right on. However, Meagan then fell on the throw quad Salchow and two-footed the throw 3Lz. Also, she put a hand down and fell out of the SBS 3T. The rest of their elements were high-quality and earned positive GOE. But the mistakes seemed to affect the overall performance. This program, which had been soaring and gorgeous at Skate Canada, felt emotionally flat at NHK. Duhamel/Radford placed 1st LP/overall, but their score of 131.68 was 12 points off their Skate Canada LP score. Meagan/Eric will be looking for stronger performances at the Grand Prix Final in Barcelona. Last year, they also had a somewhat disappointing event at NHK but rebounded with perhaps their best performances of the season at the Grand Prix Final. Will history repeat itself? Yu/Jin skated consistently at this event to win silver. Yu/Jin started with a strong outing of their Yulunga Spirit Dance SP. Their opening SBS 3Ts were very close and in sync. The throw 3Lp had excellent height and distance and earned almost straight +2s. Their triple twist was also very good; they were the only pair to get a level 4 on the twist. I also enjoyed their step sequence; it had good unison and was nicely choreographed. I really enjoyed this quiet, moody program, but Yu/Jin’s PCS was almost 4 points below Duhamel/Radford’s. I think Yu/Jin need to work on getting a little deeper into the ice and using their edges more. They glide lightly over the ice rather than digging in, and I think this may be holding their PCS back. They were 3rd. I thought Xiaoyu/Yang’s Creation LP was very well skated. This is one of my favorite pairs LPs of the last few seasons, and for me, they really captured the mysterious, ominous feeling of the music. Echoing the inherent tension of the music was the question of whether they’d go for the throw quad Salchow. They had a hard fall on this element at Cup of China, so I was nervous about it. They tried it again and got full rotation, but Xiaoyu could not control the landing and fell. Fortunately it wasn’t a bad fall. The other elements in the program were mostly very good. The opening SBS 3Ts and triple twist were again great; the only mistake came when Xiaoyu singled the first 2A in the SBS 2A/2A sequence. It was a strong skate from Yu/Jin and they pulled up to 2nd LP/overall. With their silver here, Yu/Jin clinched a berth in the Grand Prix Final for the second year in a row. Alexa/Chris earned their second career Grand Prix medal here with two solid performances. Scimeca/Knierim’s Metallica SP is proving to be a very successful program for them. After winning the short program at Skate America, they placed a strong 2nd here to Duhamel/Radford. Their triple twist was excellent, with great height, and earned some +3s. Their hand-to-hand lift was lovely as well, with great speed and ice coverage. I love Alexa’s swan lift position; she has a nice arch and her shoulders are very firm and high; she looks regal up there. Chris put a hand down on the SBS 3S, but that was the only element with negative GOE. I thought their step sequence was their best of the season so far; they still need just a tad more energy at the end, but overall this program is fun to watch and a great package for them. Alexa/Chris followed with a solid rendition of their Elizabeth: The Golden Age LP. They opened with a mistake on the quad twist; Alexa stumbled coming out. It was hard to tell what the problem was exactly—it looked like her blade just landed at an awkward angle. They received -2s/-3s for the element (but inexplicably, one +3 as well) for a total of 6.00 on the element. (Which was actually 1.60 points less than they received for their triple twist in the SP.) However, Alexa/Chris recovered with good SBS 3S and a very big throw 3S that got mostly +2s. Chris put a hand down on the SBS 3T and had a balance check going into the SBS spins. But their other elements were pretty good. I really like this Elizabeth program for Alexa/Chris. It hasn’t been universally well received, but I enjoy it. The music is big and driving and powerful, and I think it suits S/K’s athleticism and Alexa’s fierce personality as a competitor. The pace is very fast, but I think it works; it pushes them and emphasizes their power. Alexa/Chris were 3rd in the LP but had higher PCS marks than Yu/Jin. It’s been such a successful Grand Prix season for Scimeca/Knierim. They entered the season as long shots to make the Grand Prix Final, but medaled in both their GPs and have now booked their ticket to Barcelona. It’s the first time in 9 years that an American pair has made the Grand Prix Final; a major achievement for Scimeca/Knierim. They still need to work hard to improve their consistency and presentation, especially in the long program, but they’re on the right track. After a weak showing at Skate Canada, I think Vera/Andrei surprised many with their 4th-place finish here. They set new personal-best scores in both segments of the competition. Bazarova/Deputat opened with a lovely performance of their Chopin Nocturne No. 2 SP. This program is very pure and classic in style and really shows off Vera at her elegant best. Vera/Andrei also delivered some solid technical elements. The throw 3Lp had nice distance and a beautiful, long edge on the landing. The step sequence was smoothly integrated into the choreography and earned level 4 and positive GOE. On the SBS 3T, Vera’s landing was low and tight, but that was the only error. Otherwise it was a lovely package, and they earned 64.06 for 4th. Their triple twist looked much improved from Skate Canada. Vera/Andrei are using a slightly different technique on the twist. Andrei throws Vera up and out, away from his body, whereas most pairs keep the twist action right above the man’s head. It’s working for them, though; they got level 3 and all positive GOE on both twists here. Bazarova/Deputat’s Beatles LP was not as strong as their SP, but not bad either. They landed a nice throw 3F, and the first two lifts were very good and scored well. Vera/Andrei’s lifts are noticeably improved this season. Andrei’s footwork is better, and the transitions in the air are smoother. The lifts are also spaced out a little better within the long program. The death spiral and combo spin both got level 4 with positive GOE. As usual, Vera struggled a bit with the SBS jumps, but there were no major errors. I have to agree with the British Eurosport commentators’ assessment of this program artistically: I like the concept and music selection a lot (if not Vera’s short-shorts), but choreographically it’s missing a little something. I hope that Vera/Andrei will work their choreographer to continue to improve it. They were 5th LP/4th overall. Bazarova/Deputat will now prepare for Russian Nationals. With Tarasova/Morozov and Astakhova/Rogonov both skating inconsistently this season, it’s conceivable that Vera/Andrei could pull an upset at Russian Nationals and place above one or both teams. Luba/Dylan took 5th in this event. They skated much better here than at Cup of China. Their “Since I’ve Been Loving You” SP was pretty solid. They both put a hand down on the SBS 3Ts, but all the other elements were clean, with no negative GOE. The back outside death spiral was very nice and earned one +3 mark; the step sequence was a highlight and got level 4 and +1s/+2s. I’m not a huge fan of this Led Zeppelin program, though. They interpret it well, but stylistically it doesn’t take advantage of Luba’s exceptional carriage and elegance. I just feel like another musical style would have been a better choice for them as a team. But it was a good performance, and they were 5th. The long program was somewhat mixed for Luba/Dylan. The first two lifts were lovely, with good speed, and the triple twist was completed without error. However, there were problems on the jumps. Luba had a hand down on both throws, singled the SBS 3T, and underrotated the SBS 3S. Despite the technical mistakes, they still maintained great speed and flow throughout the program. Luba/Dylan move over the ice with a lot of ease, compared to some of the other teams (for example, James/Cipres), and I’d like to see this quality rewarded a bit more in their PCS marks. Their long program is set to Rachmaninov’s No. 2 Symphony in E Minor, and I thought they captured the majestic, joyful feel of this music nicely. I wasn’t too sure about this program earlier in the season, but it’s growing on me, and I think their interpretation is developing. They were 6th LP/ 5th overall, an improvement from their 7th place overall at CoC. Their total score at NHK (180.63) was almost 14 points higher than CoC, so that’s good. They’ll need to keep working hard, though, to prepare for Canadian Nationals, where 4 strong pairs will be battling for 3 available slots to Four Continents/Worlds. 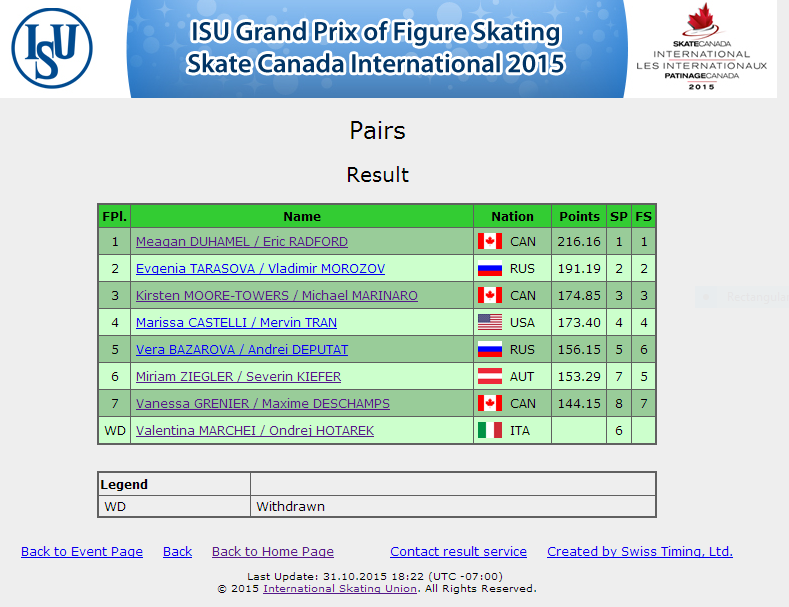 Vanessa/Morgan came into NHK with a shot at making the Grand Prix Final. However, they had a somewhat disappointing event and placed 6th. Vanessa/Morgan put out some great elements in their SP. Their SBS 3Ts were close and in sync; the throw 3F was good; and they had almost straight +2s on their hand-to-hand lift. However … they also made a big technical error when Vanessa’s foot left the ice during the combo spin. The element was disallowed, costing them at least 4 points. It was really too bad, as the rest of the program was quite strong. Like Stolbova/Klimov, James/Cipres’s SP is set to “I Put a Spell on You.” This sultry, bluesy music works well for them; it emphasizes their strengths (charisma, athleticism, sexiness) and minimizes their weaknesses (skating skills, lack of refinement/polish). They had 3rd-best PCS marks but could only place 6th due to the spin snafu. Vanessa/Morgan did their best to recover in the long program, but could not make up enough ground to medal. They went for a SBS 3T/3T combination (exciting to see), but the second jump was downgraded. Both throw jumps had impressive height, but Vanessa 2-footed the first and put a hand down on the second. Their Romeo & Juliet LP is nice and they performed it fairly well, but it’s not as distinctive or well-suited to them as their short program. They pulled up to 4th in the LP, but remained 6th overall. The good news for Vanessa/Morgan is that their lifts and twist are much improved from last year. They’re getting better height now on the twist and are avoiding negative GOE. Also, their lifts look noticeably smoother and faster this year. Vanessa/Morgan’s main weakness continues to be skating skills. Whenever they get into a footwork sequence, they just look heavy and slow, and the program loses momentum. They’ll need to work on this and also their jump consistency before Europeans. This was Jessica/Zach’s first major competition back since Zach’s surgery last spring. Their short program is set to “It’s a Man’s, Man’s, Man’s World,” a bit of an odd choice. This song can have a self-mocking humorous slant when a guy performs it (a la Sergei Voronov last year), but the humor gets lost with a pair. Regardless, Jessica/Zach were nicely secure and confident with this program. Zach fell on the opening SBS 3S, but the other elements were well done. The highlight was the throw 3Lz right at the end of the program. This is a consistently strong element for Jessica/Zach, so I think it’s a great choice to finish the program with it. They earned 55.19 for 7th. Calalang/Sidhu’s Romeo & Juliet long program was a bit rocky. They underrotated the opening SBS 2A, and Zach popped the SBS 3S to a single (which earned only 0.14). The lifts were a bit rough at points, and Jessica fell on the throw 3F. They kept up the performance level fairly well, but clearly are not back at full strength yet and placed 7th LP/overall. Hopefully they can become more consistent by U.S. Nationals. Amani/Christopher were a surprise last-minute pick for this event after Volosozhar/Trankov withdrew. Unfortunately, Fancy/Boyadji couldn’t take advantage of the opportunity and skated poorly in both segments, earning negative GOE on the majority of their elements. Their total score of 125.80 was the lowest of any pair on the Grand Prix this season. This Challenger Series event also took place over the weekend, with notable appearances from Savchenko/Massot and Della Monica/Guarise. Aliona/Bruno had a good outing here and won the event easily, just a week after their spectacular debut at Tallinn Trophy. Their Cirque du Soleil short program was very good. Aliona stepped out of the SBS 3T, but all the other elements were extremely well done and earned +2s/+3s almost across the board. I find this program charming and entertaining to watch, and the judges did as well. Aliona/Bruno earned 76.30—the highest SP score of the year so far for pairs. Unfortunately, Aliona/Bruno’s LP was not as brilliant as their effort in Tallinn. The triple twist and lifts were again outstanding, but Aliona had minor 2-foot/stepout errors on all 4 jump elements. They still need more speed and sharpness in their Peer Gynt program, but it’s amazing how polished they already look for such a new pair. Their PCS score of 70.16 is on par with what the top teams have been getting on the Grand Prix. Savchenko/Massot were scheduled to compete at Golden Spin next weekend but have withdrawn. Most likely, they’re worn out after 2 weeks of competition/travel and the mental/emotional high of their debut in Tallinn. They’ll want to work on their jump consistency heading into German Nationals—and, hopefully, Europeans/Worlds later in the season! Nicole/Matteo haven’t competed much this season. Their only Grand Prix was the canceled TEB, and their only Challenger Series event prior to this was Ice Challenge in Austria, where they had a subpar performance. This competition was much better; they set new personal-best scores in both programs. Their Romeo & Juliet LP was a breakthrough of sorts for Nicole/Matteo. They had a few minor errors—Nicole stepped out of the SBS 3T and 2-footed the throw 3S—but they stayed on their feet throughout, which is key. They’ve struggled so much the last year or so with big, disruptive falls in their programs, so it was great to see them perform more consistently here. The rest of the elements were strong, and they presented the program nicely. Nicole/Matteo are not known for innovative choreography, but I find their programs solidly entertaining and enjoyable to watch. They also have a good rapport between them, which helps. Della Monica/Guarise will compete again next week at Golden Spin. With the Grand Prix series finished, the next big event is the Grand Prix Final in Barcelona in 2 weeks. The pairs finalists include 5 teams from last year’s GP Final (Duhamel/Radford, Kavaguti/Smirnov, Sui/Han, Stolbova/Klimov, and Yu/Jin) plus 2 new teams (Scimeca/Knierim, Seguin/Bilodeau). It should be an interesting event, and I’m looking forward to it. First, though, we have Golden Spin of Zagreb, the final event in the Challenger Series, coming up next weekend. This will be quite an interesting event for pairs fans, as it features not only Della Monica/Guarise but also three strong Russian pairs: Tarasova/Morozov, Astakhova/Rogonov, and Zabijako/Enbert. It’s also a must-see for American pairs fans: There will be a matchup between Kayne/O’Shea and Castelli/Tran, as well as the senior international debut of last year’s U.S. junior champions, Fields/Stevens. Hoping to see some good performances from all these teams! The Grand Prix got back on track this week with Rostelecom Cup in Russia. Rostelecom is a fun event because it usually draws a big and enthusiastic crowd. Plus, there’s always a lot of famous skating stars in the audience, which makes for fun reaction shots. As often happens, the Russian pairs dominated this year’s event at Rostelecom, finishing 1-2-5. However, for me, the most exciting pairs skating of the week took place not at Rostelecom, but at Tallinn Trophy in Estonia. Former World champion Aliona Savchenko returned to competition at this event with her new partner, Bruno Massot. It was certainly the most exciting and promising debut for a new pair since Volosozhar/Trankov in 2011. Let’s take a look at all the action this week. Stolbova/Klimov took gold at Rostelecom and are getting back into form after a disappointing 4th-place finish at Skate America. In Milwaukee, Stolbova/Klimov’s timing and coordination seemed quite off. But it’s all starting to come back now. This was the best they’ve skated since Europeans last season. Ksenia/Fedor started with a strong performance to “I Put a Spell on You.” The program featured a great throw 3F, good SBS 3Ts, and a very good step sequence that earned level 4 and +2s. This program is just tailor-made for Ksenia; it shows off her sexiness, attitude, and skating skills to perfection. I would like to see a little more connection between her and Fedor. But it was very good and Ksenia/Fedor earned 75.45 … the highest SP score on the Grand Prix so far this season. I felt this score was a wee bit inflated. Ksenia/Fedor’s triple twist was not the strongest; Ksenia was almost on the ice before Fedor caught her. Also, the program was good but still needs a bit more speed IMO. Stolbova/Klimov’s LP was not perfect, but much improved over Skate America. Their opening triple twist was better than in the SP. They again attempted their new SBS 3T/3T/2T combo, but Ksenia underrotated the second triple and singled the last jump. However, they came back strong with a throw 3S that was exceptionally fast and secure and earned almost straight +3s. Ksenia spun out of the SBS 3S, and the lifts were still a bit scratchy in spots. On replay, the throw 3F looked slightly 2-footed, yet still earned mostly +1s. A highlight was the SBS spins, which were perfectly synchronized and very effective. Technically, there are still some things to clean up. However, the overall effect of the program was strong, simply because Ksenia/Fedor’s basic skating is so good. Their speed, edges, power, were all a level above the other pairs. And their long program to The Unknown Known is starting to come together. It’s intriguing, moody, and edgy. Last spring in my blog post about Stolbova/Klimov’s withdrawal from Worlds, I talked about three key ways they could improve this season: 1) Add new SBS jumps, 2) Add a quad throw, 3) Get better programs. They are accomplishing 1) and 3). Their new SBS 3T/3T/2T combo isn’t consistent yet, but it’s getting there. And their programs are much better suited to their style than last year’s, in my opinion. They’re making progress, and this win should give them a confidence boost. Next: Stolbova/Klimov are now 3rd in the Grand Prix standings and will likely qualify for the Grand Prix Final. Yuko/Sasha had another lovely performance in the short program. They again landed strong SBS 3Ts, earning several +2s. The SBS jumps have been tough for Yuko/Sasha the last few years, so I’m really happy to see them landing the SBSs more consistently this season. Their triple twist, throw 3Lp, and combo spin were also well done. The only problem came with the opening death spiral, which received level 1, costing them about 1.5 points in base value. Otherwise, the program was wonderful, and they placed a strong 2nd. Unfortunately, Yuko/Sasha could not maintain this standard in their Manfred Symphony LP. They opened with 2 good sets of SBS jumps. However, Yuko stepped out of the throw 4S, then 2-footed and fell on the throw 4Lp. The rest of the elements were completed but not with the best speed or quality. Overall the performance was a bit sloppy, and their final score was about 7 points off what they earned at Cup of China. Still, it was enough for silver. With their medal here, Kavaguti/Smirnov earned a spot in the Grand Prix Final. Peng/Zhang finished a distant third at Rostelecom, almost 15 points behind the Russian teams; certainly not the outcome they were looking for in their first full event of the season. Everything started well in their Come Together SP. The opening death spiral and throw 3Lp were excellent and earned +2s/+3s; they also landed the oft-troublesome SBS 3Ts. All was looking good, but then Cheng Peng fell on forward crossovers heading toward the triple twist. They completed the twist but earned only level 1, and the program ended flatly. I was disappointed because I really love this short program. The music is sharp and interesting, the choreography is good, and potentially it’s a great package. But Peng/Zhang have not yet skated it the way they need to. They placed 3rd. Peng/Zhang were unable to pull up in their Pearl Fishers LP. There were a number of technical problems in the first half of the program. The quad twist was clearly underrotated on replay (although they avoided receiving -GOE). They landed the SBS 3T/2T combo, but then Cheng Peng fell hard on the throw quad Salchow attempt and stepped out of the throw 3Lp. Lifts and spins were pretty good, and they kept up the performance level as much as possible, but it was not a great debut of their new LP. The mistakes made it hard to get much impression of the program; it seems a bit heavy and histrionic for Peng/Zhang, who IMO excel at interpreting more subtle, restrained music.They earned 124.94 for 3rd place (but were only about 2.5 points ahead of Americans Kayne/O’Shea in the LP). It’s been a very rocky start to the season for Peng/Zhang. Following their disappointing short program at TEB last week, the team returned to China and then flew to Moscow for this event. I don’t know if the travel exhausted them or if there are other factors involved, but either way, their performance was much below their usual standard, and they will probably not make it to the Grand Prix Final. Something seems off; their timing on lifts, transitions, and footwork is not as smooth as normal. And Cheng Peng has been looking quite unhappy in the kiss-n-cry—which makes me sad, as I’m a tremendous fan of hers. 😦 I hope their season improves from here. Next: Uncertain. Probably Chinese Nationals or 4CCs. Tarah/Danny had a strong showing in the long program to unexpectedly take 4th place at this event. Kayne/O’Shea’s Espana Cani SP was somewhat tentative. Their triple twist was low/crashy; Tarah spun out of the SBS 3S; and the throw 3Lz was 2-footed. All three elements got negative GOE, and Tarah/Danny only had one level 4 element (the lift). They did their best to sell the Spanish-themed program, but were 6th in what seemed like a continuation of their troubles from Skate America. 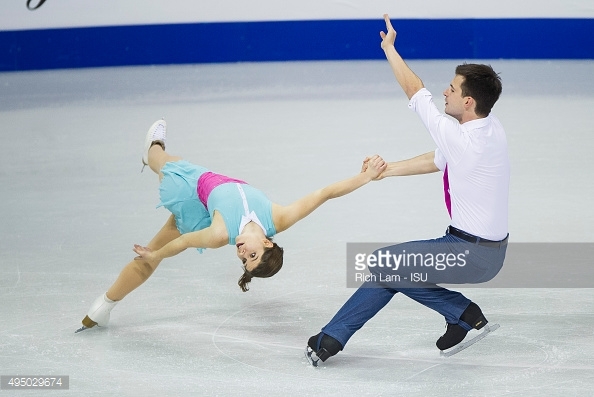 However, Tarah/Danny then stormed back in their POTO long program and put out their best skate of the season so far. They opened with a better triple twist, followed by a strong set of SBS 3Ss that were close and in sync. Tarah/Danny chose to go for throw triple Salchow here (instead of the throw quad they tried at Skate America). I think this was smart; they earned all positive GOE for a total of 5.50 on the element (as opposed to 2.70 for the failed quad at SA), plus there was no disruption to the program. Tarah did have a small stepout on the second SBS 2A and the throw 3Lz was 2-footed. However, the SBS spins and lifts were quite strong. Tarah/Danny maintained good speed and presented the program well, with full commitment to the choreography. Although there are still things to work on, it was a clutch performance for them. They earned a personal-best 122.45 to jump into 4th place. I think Tarah/Danny did exactly what they needed to here. They showed the international judges that they can put out a well-rounded program with good elements, and they showed they are solid contenders heading toward U.S. Nationals. Tarah/Danny’s Rostelecom LP score is the highest of the season among U.S. pairs (just slightly above Scimeca/Knierim’s 122.28 at SA). So they are well positioned. Next: Golden Spin of Zagreb (Dec. 2-5). At thisevent, Kayne/O’Shea will meet U.S. rivals Castelli/Tran, as well as Savchenko/Massot and three strong Russian pairs. This was the Grand Prix debut for Zabijako/Enbert, who have only been together since last spring. They did well here and were 5th overall. Zabijako/Enbert’s “I’ll Never Forget You” SP was nicely done. They landed all their jump elements, and the lift was good. The only problem came on the death spiral, which was not low enough and earned only basic level. They placed 5th. Zabijako/Enbert then followed with a quite strong performance of their Thunder in Heaven LP. They had a couple mistakes on SBS jumps. However, all their other elements were clean, including the two throws. They had no negative GOE in the whole program except for those SBS jumps; technically, it was a strong skate. There is not much character or distinctiveness yet to Zabijako/Enbert’s skating, and their programs are generic. But they look elegant together, have nice lines and good flow, and just a good overall skill level, so the future looks promising. This was Valentina/Ondrej’s first event since Ondrej suffered a concussion at Skate Canada. They skated reasonably well but placed 6th, lower than expected. Marchei/Hotarek had a few technical issues in their “Mourir d’Amour” SP. The opening SBS 3Ss were great, but the triple twist was low/crashy, with a weak exit. The death spiral got only basic level, and the throw 3Lz was landed but small. I’m not a big fan of this program for Marchei/Hotarek. The serious dramatic music doesn’t allow Valentina to shine and sell the program the way she usually does. Nonetheless, they received 4th-best PCS scores and were 4th in the SP. Marchei/Hotarek’s LP, set to a medley of 70s music, was interesting. This routine seems closer to Valentina/Ondrej’s natural style, but it’s overly busy, with 4 different songs included. Every time Valentina/Ondrej started to get into a song, the music abruptly switched to the next piece. It was just a little too much, and they seemed tentative throughout, lacking their usual speed. There weren’t any falls, but there were a lot of smaller technical issues—Valentina doubled the SBS 3Lz, costing them almost 4 points in base value, Ondej turned out of the SBS 3S, and there was a scratchy landing on the throw 3Lz. The technical issues added up, and Marchei/Hotarek dropped to 6th LP/6th overall. This event was a setback for Moore-Towers/Marinaro, following their bronze medal at Skate Canada. They placed only 7th in both segments/overall. Kirsten/Mike opened their Etta James SP with an okay triple twist. The catch was too low, but they got by with only a couple -1s. Next came very good SBS 3Ts. But their lift received no points, apparently because Mike lost his arm lock during a transition, and then they both fell on the throw 3Lp. I like this program for Kirsten/Mike; they express the music well. But they could not overcome the technical errors and scored only 51.97, more than 11 points off their Skate Canada SP score. Their Romeo & Juliet LP was better, but not enough to pull up in the standings. Both throw jumps were 2-footed, and they doubled the SBS 3S. The twist again landed on Mike’s shoulder and got only level 1. Lifts are improving, but still need work. The closing death spiral was good. This Romeo & Juliet program is a very different look for Kirsten, and I still don’t think it was the best choice for this team. But it’s getting better; they’re looking more comfortable and capturing the poignant feel of the music a bit more. I thought they did a pretty good job keeping up speed and momentum, despite the mistakes. However, the judges were not impressed, and Kirsten/Mike’s PCS score dropped 4.5 points from their Skate Canada LP PCS score. 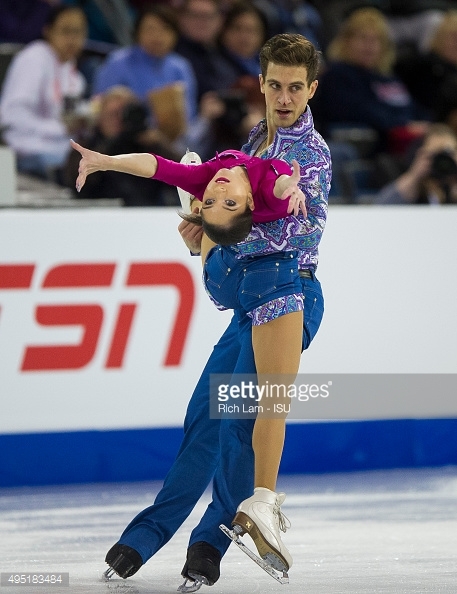 Like Zabijako/Enbert, this pair was also skating in their first Grand Prix event after only 6 months or so together. Tallinn Trophy started 2 days before Rostelecom. This senior B event marked the return to competition of 5-time World champion/2-time Olympic medalist Aliona Savchenko and her new partner, Bruno Massot. I’ve been a fan of Aliona for such a long time and followed her and ex-partner Robin Szolkowy through all five of their World titles–as well as their Olympic heartbreaks. I’ve missed Aliona so much and was thrilled to see her back on the ice in Tallinn. Still, I had no idea what to expect from her and Bruno. I figured they’d be like most new pairs—some great stuff here & there, along with some mistakes and not-so-great elements. I was wrong. Aliona hit the ice in Tallinn like she had never been away. Everyone is rusty after a year-and-a-half off competition, right? Even Olympic champions get rusty. Well, not Aliona Savchenko. Aliona/Bruno started their Cirque du Soleil SP with possibly the highest triple twist I’ve ever seen. Next came a huge throw 3F (just slightly 2-footed). Aliona did stumble out of the SBS 3T. (Okay, she’s human.) But the rest of the elements were very good. The death spiral was a particular highlight, with a great position from Aliona, and the program was fun and interesting. When the scores came up, they were huge. All level 4s except for the twist (level 3). All +2s/+3s for the twist. PCS marks in the high 8s. Total score: 71.44. The long program was perhaps even more impressive. The twist was again incredible, this time earning almost straight +3s. It’s so high and so well controlled, Bruno has time to catch Aliona by the waist and delay for a moment, before gently setting her down. They followed this with a SBS 3T/3T sequence—in sync, perfect. Then SBS 3S—landed. The throw jumps are so high, they haven’t yet learned to fully control them; both were slightly 2-footed. But such potential. And the lifts! The entrances/exits are light and smooth; Aliona’s positions are more pristine than ever; ice coverage seemed good. When all was said and done, they again had level 4s on everything except the twist. They earned over 13 points on GOE in the long program alone. Their final score: 142.88. That’s a number that only 2 pairs have beaten on the Grand Prix this year; and in each case, by less than 1 point. To see this kind of scoring firepower from a new pair is almost unbelievable. Not only did Aliona/Bruno bring the tech content, they looked strong artistically as well. I really liked both programs, especially the Peer Gynt LP choreographed by Gary Beacom. It’s odd, angular, and intriguing; reminiscent of the inventive edginess that Savchenko/Szolkowy were known for. Aliona/Bruno already have great unison, good partnering, and interesting interpretation. One area to work on is speed; they did look tentative at times. Hopefullyimproved speed will come with more competitive experience. What impressed me most about Aliona/Bruno? They made it look easy. They made it look like it’s no big deal to get tossed 4 feet up in the air, or to lift your partner one-handed. There was a lightness and ease to their skating that we haven’t seen much in pairs lately. Stolbova/Klimov are amazing—but they don’t necessarily make it look easy. You can see how much work it is when you watch them skate. It was different with Aliona/Bruno. I hope they can keep that light feeling about their skating, even under the grind of competition and training. Aliona/Bruno are now scheduled to compete at the last 2 Challenger Series events. I’m just pinching myself and crossing my fingers, hoping this week in Estonia wasn’t some fluke, and that they’ll not only be as good the next couple weeks, but perhaps even better! The pairs skating world is a much more exciting place with Aliona Savchenko in it. Mari/Ruben continued their debut international season with another set of pretty good performances to claim the silver at Tallinn Trophy. I’m really starting to enjoy this team. They seem well matched both physically and in temperament, and I like how they maintain their performance level even when technical mistakes occur. They’ve been fairly steady competitors so far; hopefully it continues that way. This was Maddie/Max’s first international competition this season, as they’ve been out with injuries. They had a decent event here but had to settle for 5th place. Maddie/Max’s new programs are lovely and more mature than last season’s; a nice step up for them. However, they did struggle with the technical elements, especially SBS jumps and lifts. And they will need to train more to get their speed back up to last year’s level. Still, it was nice to see them back, and hopefully they can make good progress before Nationals. The other big pairs news of the week was Volosozhar/Trankov’s withdrawal from NHK Trophy. Tatiana has an injury and was told to take several weeks off. Will we see them at Russian Nationals in late December?? I hope so! The Grand Prix concludes next week with NHK Trophy in Japan. Even with Volosozhar/Trankov out, it should be a great competition. Four pairs at NHK will be seeking to medal and book their ticket to the Grand Prix Final: Duhamel/Radford, Yu/Jin, Scimeca/Knierim, and James/Cipres. It sure will be interesting to watch! It’s been 2 days, and I still can’t shake the sadness and confusion I’ve felt since Saturday morning, when I learned that 127 (now 132) people were killed in terrorist attacks in Paris and that Trophee Eric Bompard was canceled midway through the competition. Things don’t feel right with the world. Both the larger world, and our own much-loved world of figure skating—which, for many of us, helps makes the larger world a better place. Of course, my thoughts lie with the victims in France. And with the French skaters and coaches, who were particularly affected by the tragedy, as most of them train in the Paris area. In the aftermath, it felt odd to do my usual pairs review of the event. Instead, I’ll just touch on some of my thoughts from this weekend. 1. The ISU needs to implement a crisis management plan. The ISU was clearly caught unprepared by this crisis. It was the French authorities who determined that TEB must be canceled (not the ISU or the French federation). Questions immediately arose as to how the cancellation would affect qualification for the Grand Prix Final, as well as allocation of TEB prize money. The ISU apparently had no existing rules regarding canceled competitions and the resultant issues. We now wait for the ISU Council’s emergency decisions on these matters, to come on Tuesday. Some say the ISU could not have anticipated such a tragedy and therefore couldn’t have been expected to plan for it. I cannot agree. The concept and advisability of crisis management planning is well understood in the business world. Developing contingency plans for unlikely, but possible, events is considered good management practice. Crisis planning goes by different names—crisis management, disaster recovery, business continuity, risk management—but whatever the jargon, the concept is easy to grasp. Anyone running a business or organization of appreciable size should think about, and plan for, as many eventualities as possible. No one could have imagined this particular tragedy, but anyone could imagine a competition interrupted by a natural disaster, mass power outage, or political crisis. The ISU can and must do a better job of crisis planning. There are many tools to help, including dozens of books on crisis management and disaster recovery; consulting firms that specialize in crisis planning; and many organizations, such as the Red Cross, the U.S. Small Business Administration, and FEMA, which provide guidelines and protocols. 2. I wish the ISU would also consider implementing a stronger policy regarding concussions. The day before the Paris tragedy, we saw a worrisome event at TEB itself. While attempting a throw quad Salchow in practice, Cheng Peng of China fell and hit her head on the ice. This accident was caught on video by The Blade Boys. It was scary to see Cheng fall and hit her head this way. She appeared to be okay afterward and continued practice, following a very brief break and exam by the Chinese coaches and members of the Russian/French staffs. However, appearances don’t always tell the full story with head injuries; sometimes an athlete can have a concussion, yet not realize it. In the short program the next day, Cheng fell before the program even began and then fell again on the SBS 3T. It’s very possible that Cheng’s problems in the SP were completely unrelated to the practice accident. But I would have felt much better if she had received a thorough medical examination before continuing. The ISU does not currently seem to have any specific policy on concussions (either at, or outside, competition). Rule 141 of the ISU Constitution and General Regulations 2014 simply states: “It is the responsibility of all Members to ensure that their Competitors can physically and mentally compete safely.” So, the federations are charged with evaluating any head injuries. In this respect, ISU policy isn’t too different from that of FIFA, NFL, or NHL. All of those governing bodies require examination of head injuries during games by team doctors (as opposed to league/FIFA representatives). However, one difference is that the NFL and NHL require team doctors to use a standard concussion assessment tool to determine a player’s fitness. The ISU could consider implementing a similar requirement. Or it could provide independent medical consultants at events, as the English Premier League does with its “tunnel doctors,” although this would obviously be an additional expense. I’d like to see the ISU get more involved in this issue because it seems concussions are a growing problem in skating. This season alone, there have been 5 confirmed cases of concussions among elite skaters (Joshua Farris, DeeDee Leng, Caitlin Yankowskas, Ondrej Hotarek, and of course reigning World champion Gabriella Papadakis). There may be more unconfirmed cases. Another worrisome factor: Some studies suggest that female athletes may be more susceptible to, and/or suffer more serious, sports-related concussions than male athletes. Although this is still a theory, it’s something to consider in figure skating, a sport with many female participants. Bottom line is, I’d like to see the ISU think proactively about this issue and take steps to address it, even if it’s just a matter of further investigation or issuing more detailed guidelines to federations. 3. On a happier note, it was great to see Olympic champions Volosozhar/Trankov back in Grand Prix competition. This fall, Volosozhar/Trankov became the first reigning Olympic pairs champions to return to competition in 22 years. The last time this happened was back in 1993, when reigning Olympic champions Mishkutionok/Dmitriev returned for the 1993-94 season. I give Volosozhar/Trankov a ton of credit for coming back to competition–especially now, with the technical demands of pairs skating escalating and the discipline in flux. To me, it signals that Tatiana/Max’s competitive spirit has not dimmed and that they still want to make an impact in the sport, even though they’ve already achieved all the highest prizes. I enjoyed seeing them in the short program at TEB. Tatiana/Max are not yet back in top competitive shape, but they were much stronger at TEB than at Nebelhorn. I liked their new Bollywood SP and felt it was a cut above the other pairs’ short programs in terms of concept and choreography. I’m glad that the Olympic champions decided to return, and it will be interesting to see what they can bring to the discipline over the next few seasons. 4. I hope that everyone can accept whatever solution the ISU chooses for Grand Prix Final qualification. The debate on skating forums and Twitter about the TEB cancellation and how it should affect GP Final qualification has been bruising and contentious. It’s pretty clear at this point that no solution can be perfectly fair to all the skaters. Sometimes you just have to take the best of the bad choices, and move on. One thing to bear in mind: It’s just the Grand Prix Final. Yes, it’s an important event, and there’s prize money involved. But it’s not like anyone is missing out on a spot to Worlds or Olympics. Will things return to “normal” as Grand Prix competition resumes at Rostelecom Cup next weekend? Probably not, with thoughts of Paris still in everyone’s mind. But perhaps the skating world, at least, can start to get a little closer to normal. I hope. For me, last year’s Cup of China was one of the most interesting pairs events of the season. Peng/Zhang’s victory and the emergence of Yu/Jin and Wang/Wang as Grand Prix medalists signaled a coming-of-age for a new and exciting generation of Chinese pairs. This year’s Cup of China was again successful for the Chinese pairs, as they placed 2-3-4. However, I don’t think many people expected to see Kavaguti/Smirnov on top of the podium! Their victory over World silver medalists Sui/Han was quite a surprise. Kavaguti/Smirnov turned in two good performances in Beijing to get their Grand Prix season off to an excellent start. Yuko/Sasha opened their short program with a nice level 4 death spiral that earned high marks. This elegant move set the tone for the program, and Yuko/Sasha followed with good SBS 3Ts. There was a slight problem on the exit of the triple twist, and the first part of the spin was awkward. However, their hand-to-hand lift was very effective with the music. Technically it was a good performance, and in my view, they shone artistically as well. I really like Yuko/Sasha’s new short program to “I Finally Found Someone,” a 1996 Bryan Adams/Barbra Streisand duet. Many feel the music is hoky and dated–yeah, it’s not exactly current. But, that aside, I think the program has a wonderful, romantic feel that shows off some of the best sides of Yuko/Sasha’s skating—specifically, their musicality and the strong, interesting contrast between them. Yuko has such a delicate, feminine quality, while Sasha has strength and dynamism. Because of this yin/yang, for me there’s always an inherent romanticism to their skating (even though they’re not an off-ice couple). This program takes that quality and amplifies it. The choreography by Peter Tchernyshev is expansive and sweeps you into the mood. I love the placement of the elements, and also that Yuko/Sasha incorporate holds into their level 4 step sequence. The other pairs mostly perform their step sequences in unison, but without touching. The dance holds in Yuko/Sasha’s step sequence makes it feel more like an organic part of the program, less like a technical element. I love the whole package of this program, and the judges did too, with PCS marks up to 9.00 from some judges. Yuko’s red costume was fab, and I loved her teased, bouffant hair–the retro vibe kind of matched the music. Kavaguti/Smirnov finished the short program in 2nd. Yuko/Sasha followed with a very good performance of their Manfred Symphony LP. The program was a pleasure to watch. Yuko/Sasha’s SBS jumps were better than usual; both sets were well landed and the opening SBS 3Ts even received +2s. They also landed their throw quad Salchow; it was a little low and tight, but held. Next, they went for the throw quad loop! It was fully rotated, but two-footed and thus received all -2s. They earned 6.70 points for the throw quad loop—only .6 more than they received for their successful throw triple loop in the SP. Still, it was exciting to see them go for 2 quads. This is K/S’s second year using the Manfred Symphony LP, but the program is such a masterpiece that it didn’t feel tired at all (this time, anyway). Yuko/Sasha earned a new personal-best score of 143.55. One criticism: I wish Yuko/Sasha could improve the speed of their elements. Their lifts and spins start fast, but tend to slow noticeably as the rotations go on. If they could just correct this problem and maintain more consistent speed throughout their elements, their GOE would be higher, and really the whole impression of their skating would be improved. I assume this is something they work on in training. But I’d love to see them emphasize it more, as opposed to, say, the quad throw loop. Yuko/Sasha now have an excellent chance of making the Grand Prix Final. I hope they can build on this momentum! 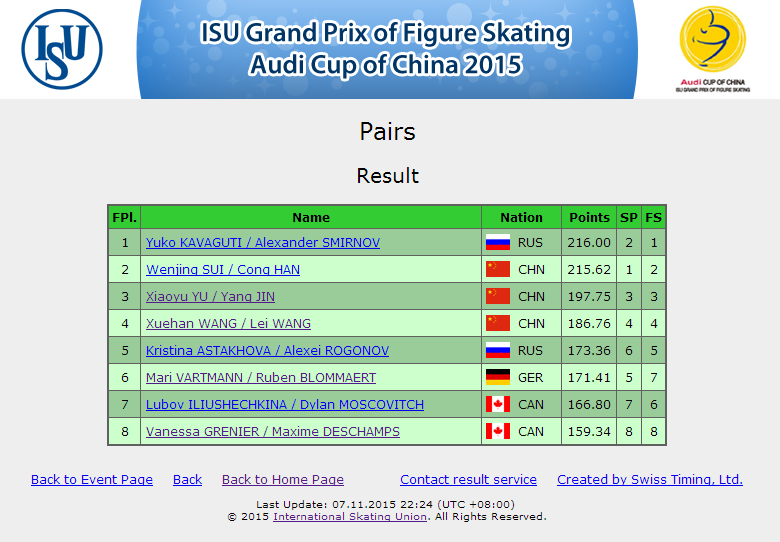 It was a bit shocking to see Sui/Han place 2nd at their home GP event. True, it was a close competition, and they finished less than 1 point from the gold. Still, it was a surprising result, as Sui/Han had been expected to dominate. After the event, we learned that Wenjing has an Achilles tendon injury, which no doubt negatively affected their skating. Sui/Han won the short program with a strong performance of their Spanish Romance SP. Wenjing put a hand down on their opening SBS 3T, but that was the only mistake. They landed a great throw 3F and ‘Tano triple twist. The highlight was their closing level 4 step sequence, which was sharply executed and earned many +3s. Spanish Romance is a very effective program for Sui/Han and received 1st-place PCS marks. In the long program, Sui/Han were again very good but not great. Their opening quad twist was strong and earned 10.46 points (highest-scoring element in the competition). However, the SBS 3T/2T/2T combo could have been better. Wenjing was off balance on the first 2T, and the second 2T was underrotated. This combo is a somewhat weak element for Sui/Han; even when they land it, they typically get no runout. Their SBS 3S was also underrotated, receiving negative GOE. However, the throw jumps were excellent as usual. Sui/Han again went with throw triple Salchow instead of throw quad Salchow, due to Sui’s injury, but the throw 3S was great. And Sui/Han received a perfect score for their throw triple flip: Straight +3s for a total of 7.60. That throw 3F is golden for Sui/Han: Huge and perfectly landed almost every time. It’s really amazing. Sui/Han’s lifts were terrific as well. In the LP, they received all +2s/+3s for their lifts–more than 4 points’ GOE on lifts alone. Yet, despite the technical content, Sui/Han’s Samson & Delilah felt just a tad bit flat. This pair has improved so much artistically the last 2 years, especially Wenjing. She’s really showing off every single transition movement with so much flair and emphasis, a la Ksenia Stolbova. But still, in this program, I felt Sui/Han needed just a bit more energy and speed. The Samson & Delilah music is crowd-pleasing, but challenging. The tempo builds strongly in the last minute, and Sui/Han couldn’t quite keep pace here, finishing behind the music and getting a time violation. Sui/Han qualified for the Grand Prix Final with their silver medal. They’re skating very well this season, but haven’t been quite as dominant as I was expecting. They now have a month’s break before the Grand Prix Final in Barcelona. I hope that will be enough time for Wenjing’s injury to heal. I was happy to see Yu/Jin again in Beijing. 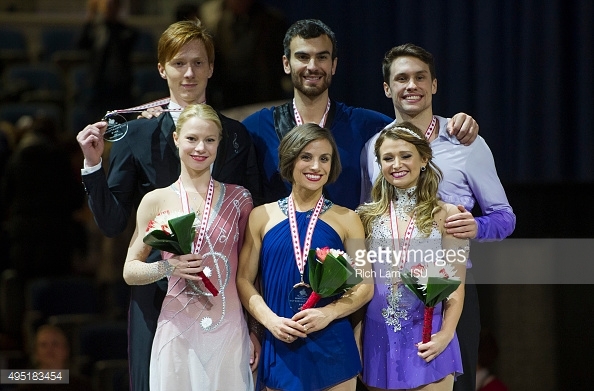 They were such a wonderful surprise last year in their first senior Grand Prix season, and I’ve missed them. It’s been 8 months since we last saw them at Junior Worlds. Yu/Jin won bronze here and set new personal-best scores in both programs. Yet at the same time, I think many expected they would win silver. Yu/Jin opened their Yulunga Spirit Dance SP with very good SBS 3Ts that were close and well-synchronized. Their level 4 triple twist was excellent, with great height and a smooth catch. I felt like they were concentrating on the elements a lot; to me, the performance didn’t really sing/project to the audience as much as it could have. The judges seemed to agree, with PCS marks that were 3-4 points behind S/H and K/S. But Yu/Jin earned over 70 points in the short program and were in 3rd. Yu/Jin started their “Humility and Love” LP with 2 strong sets of SBS jumps. Then they went for the throw quad Salchow, but it was underrotated, and Xiaoyu fell. The following throw 3Lp looked clearly 2-footed on replay, but the judges appeared not to notice and gave mostly +1s/+2s. The other elements were pretty good (although they were a bit slow hitting their positions in the final reverse lift). It was a fine program for Yu/Jin, and they earned a new personal-best LP score of 127.69. However, it was not their best performance artistically. This program is so lovely, but it felt just a bit perfunctory here. I’ve seen them skate it better, particularly at Junior Worlds last season. I don’t understand. And to be quite honest, I have to wonder how Yu/Jin feel about it. When you see your teammates getting new costumes and spending a month on new choreography, while you’re sitting at home practicing a program you’ve done about 1,000 times and wearing the same old thing as last year, well, I can’t imagine it’s very motivating. Yu/Jin now have 3 weeks to prepare for NHK Trophy. They will likely be fighting for bronze there vs. Scimeca/Knierim. Their scores at Cup of China indicate a clear advantage, so the outlook is favorable to medal in Japan. Making the GP Final again will be a longshot, though. It was a somewhat disappointing competition for Wang/Wang. After winning bronze at Cup of China last year, they had a subpar performance in the LP and finished off the podium. Wang/Wang started the competition with a lovely skate to their Romance SP. This light, lyrical program is a joy to watch. Their SBS 3Ts were good, and they hit a beautiful, flowing throw 3Lp. Their step sequence could have had deeper edges, but was well choreographed and performed. They received no negative GOE scores in the SP and earned a new personal-best 69.36 to place 4th. Unfortunately, Wang/Wang’s LP was disappointing, as at Skate America. Xuehan doubled both SBS jumps and again fell on the throw 3F. The throw 3Lp was landed, but not with the same quality as in the SP. Lifts and spins were all good, and strong scores on these elements helped Wang/Wang hold on to 4th place overall. Their SBS spins were a particular highlight—perfectly synchronized, with lovely positions–and earned all +2s/+3s. I continue to find their My Fair Lady program charming, but the effect was muted by the mistakes. Like Yu/Jin, Wang/Wang are also repeating last year’s programs (although they, at least, were given new costumes!). To be fair, we only saw Wang/Wang at two competitions last season, so their programs still feel fresh. With both their GP events finished, Wang/Wang’s international season is now likely over. Will it be another year before we see this talented pair again? Kristina/Alexei improved with a 5th-place showing in China, after their unexpected 7th at Skate America. Their short program to The Artist was pretty rough. Kristina had trouble on the landings of the SBS 3S and throw 3Lz. Alexei also fell on steps. Their triple twist wasn’t bad, and Kristina had a nice, low position in the death spiral. But the mistakes detracted and took some of the life out of the program. They just seemed off and not fully in sync. The scores were, if anything, a bit generous. They placed 6th. Fortunately, Kristina/Alexei were able to put out a stronger performance in their “puppet master” LP. Kristina fell on the opening SBS 3T, but their triple twist is much higher this year and got all positive GOE. Their first lift featured very nice positions from Kristina, as did the death spiral. Both throw jumps were landed. Their closing lifts seemed a bit slow. Overall, the technical elements were a mixed bag, but Kristina/Alexei were able to keep up the performance level decently and earned 114.19, almost 15 points higher than at Skate America. They placed 5th LP/5th overall. I’m sure Kristina/Andrei are disappointed with their season so far, but hopefully this long program was at least a step in the right direction. I do love both of their programs this season and hope to see them skate much better at Russian Nationals. This was Mari/Ruben’s first Grand Prix event as a pair. Only together about 6 months, they appear to be making great progress and acquitted themselves quite well here. They started with a clean short program to “Strangers in Paradise.” They landed all their elements and received no negative GOE at all—rare for a new team. I’m not a big fan of the trilling soprano vocals in their SP music, but it’s a pretty program. They earned a score of 63.45 (high for a new pair) to place a surprising 5th. Mari/Ruben’s LP wasn’t as good as their SP, but it wasn’t terrible. There was an awkward exit from the triple twist, a scratchy landing from Ruben on the SBS 3T, and a fall from Mari on the throw 3Lp. But there were many nice moments in the program. Mari/Ruben are well matched physically and have a nice, elegant line. I think their “Somewhere” LP is a good choice for them. Using only 1 song from West Side Story instead of the usual 3 or 4 makes it easier for them, as a new pair, to set a mood and interpret the music effectively. And the straightforward romantic style suits their look. They placed 7th LP/6th overall. There’s no way around it: This was quite a disappointing event for Luba/Dylan. Coming in, many had hoped they would challenge for a medal. But they had some worrisome problems in Beijing and could only place 7th. Their Led Zeppelin SP began with a decent triple twist. Luba/Dylan have struggled with this element and could only manage a level 1 twist in both programs, but nonetheless it was pretty clean and received all positive GOE, an improvement over their early-season event (Ondrej Nepela). However, Luba fell on the SBS 3S. Then, their hand-to-hand lift was ruled an invalid element. Dylan appeared to brace his hands on Luba’s thighs for the takeoff, which is not permissible in a hand-to-hand lift. (Thanks to FSU poster @luneatic for identifying this problem.) Luba/Dylan lost at least 4.50 points on this lift and ended in 7th. I/M fought back in the LP with two good throw jumps and some other nice elements. However, there were problems on both SBS jumps. And again, they received no credit for a lift! Their axel lasso lift failed on the entry, costing them a minimum of 6.50 points. Luba/Dylan finished 7th LP/7th overall.. It was just a tough competition for Luba/Dylan, and their lift problems are worrisome. They’ve actually been struggling a bit with lifts all season—there was a problem in the SP at Skate Detroit, they got only basic level for one of their lifts at Nepela, and now this. Side-by-side jumps come and go for a lot of pairs, but lifts are your bread-and-butter; what you count on for points. So, to entirely miss 2 lifts at one competition is concerning. Luba/Dylan just aren’t skating very well at this point. Something seems off. I hope they can straighten things out a bit before their next Grand Prix event, but their main focus needs to be Canadian Nationals. They must improve by then to make the Canadian team for 4CCs/Worlds. Vanessa/Maxime came to this competition straight from Skate Canada, where they had a poor showing. Considering the jet lag and letdown from that event, they actually did pretty well here. Grenier/Deschamps struggled with the jumps in their short program, but their other elements were clean. I like their Por Una Cabeza SP, but it needs a bit more liveliness and brightness. I think they’re not secure enough with the technical elements to really let loose and perform. They placed 8th. Vanessa/Maxime landed 3 out of 4 jump elements in their LP. They also had nice SBS spins. Overall, though, their skating needs more speed and attack. They were cautious and quite slow going into their elements. But it was a decent skate, and they were pleased with their score of 106.93 in the LP. –The second-year pairs, as a group, are struggling. In the 3 Grand Prix events so far, we’ve seen subpar performances from almost all of the second-year pairs: Astakhova/Rogonov, Iliushechkina/Moscovitch, Castelli/Tran, Marchei/Hotarek, and Bazarova/Deputat. Artur Dmitriev said in an interview that the second year is “a period of awareness” and challenges for new pairs–I suppose because the excitement and novelty of the new partnership has worn off, but much hard work remains. I’m rooting for all these pairs to stay with it and have faith that things will get better!! 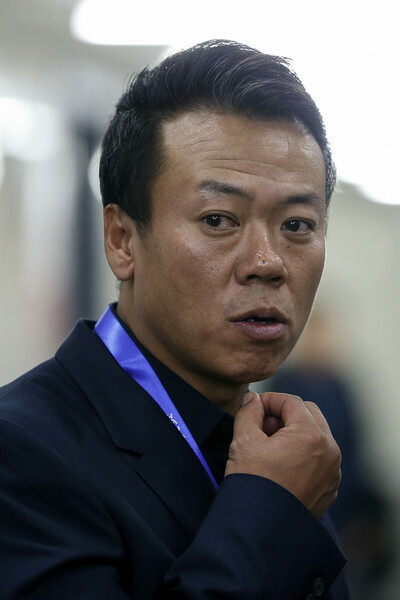 –The Chinese pairs, after an incredible season last year, are not looking quite as strong as I was expecting. Next week, we’ll see Peng/Zhang’s season debut at Trophee Eric Bompard. Hoping for strong performances from them. –Russian pairs just got even more interesting, with Kavaguti/Smirnov’s surprise win here. The pressure is now on for Stolbova/Klimov at Rostelecom. They need to do well there to keep themselves in the mix to make the Russian Euros/Worlds team. The pairs competition at Skate Canada this weekend seemed a bit star-crossed. Marchei/Hotarek were favored to medal, but had to withdraw after Ondrej sustained a concussion in practice. Several other pairs had subpar showings, and the level of competition wasn’t the highest. However, the event was redeemed by two wonderful performances from World champions Duhamel/Radford, a reminder of what pairs skating is all about. Coming into the event, I wasn’t quite sure what to expect from Duhamel/Radford. They had an uncharacteristically shaky performance at the Autumn Classic Senior B event a few weeks ago, missing both quad throws in their LP. 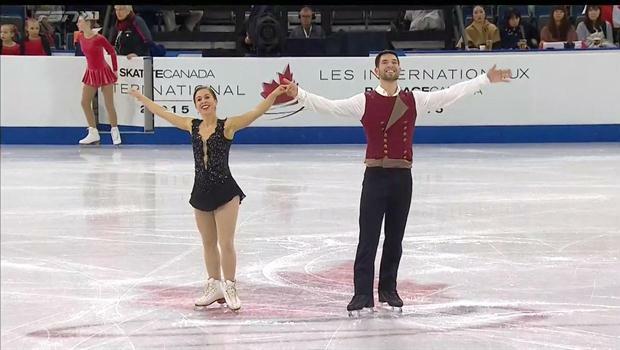 But Meagan/Eric skated very well in Lethbridge and showed everyone why they are reigning World champions. Meagan/Eric’s “Your Song” SP opened with a very high triple twist that earned level 4 (one level higher than usual). Eric put a hand down on the SBS 3Lz, but next came a gorgeous death spiral. The throw 3Lz was tilted but saved. There were some slightly awkward exits from both their choreo lift and Level 4 lift, and overall, they weren’t at their best technically. But they held it together and kept the performance level really high. I like this short program for D/R. It’s simple but effective. The music soars, and the choreography matches the crescendos really well, building excitement. I think it’s a great choice for them. Their score of 72.46 seemed a tad high, considering they had a few minor miscues, but they were deservedly in 1st place. Meagan/Eric followed with a very strong LP to Adele’s “Hometown Glory.” Their SBS 3Lz was good, and then they landed the throw quad Salchow. I thought this quad was one of their best so far. It had great height and a low, but smooth, landing. The quad earned +1s/+2s. Meagan/Eric then decided not to try their new throw quad Lutz, going for throw triple Lutz instead in hope of a clean program. Meagan did have a slight problem on the SBS 3T/2T/2T combo, popping it into 3T/1T/1T. But the final two lifts and closing death spiral were excellent, earned all positive GOE, and made for a strong finish. After last season, I wasn’t sure if Meagan/Eric could top their Muse LP, which was so popular and well-suited to them. But I think “Hometown Glory” is even better. It has more emotion and depth and maturity. The choreography is seamless and uncluttered, and Meagan/Eric performed it with wonderful freedom at Skate Canada, delivering great elements as if it were no effort at all. They just looked so secure and relaxed out there, and cruised easily to a 24+-point win. I can’t wait to see these programs again at their next event! Tarasova/Morozov put out some nice-quality programs at Skate Canada to win silver, as expected. But although they had a solid performance, there is still much to work on. Evgenia/Vladimir started their Warriors SP with a soaring triple twist that earned +2s/+3s. However, Evgenia doubled the SBS 3T, which earned less than 1 point. The throw triple loop was very high but two-footed. Their closing step sequence was well done. Overall it wasn’t a bad performance, but certainly not their best. They scored 64.00 and were 2nd. Evgenia/Vladimir had a similar performance in the long program. Again, they started with their incredible triple twist, which is surely the best in the world right now. So high and easy, this element earned almost straight +3s for 8.60 points. However, as in the SP, Evgenia/Vladimir had minor errors on the SBS jumps, and both throw jumps were huge but two-footed. They have a new group 5A lift this season, which is interesting but still not quite perfected yet in terms of the positions/transitions. It was a good performance. But overall at this point, Tarasova/Morozov are a little behind where I expected/hoped they would be this season (due probably to Evgenia’s shoulder injury this summer). Although I’m a big fan of this beautiful pair, I’m disappointed with their programs this season. I like the Celtic music for the Warriors SP, but the choreography is a little empty. It needs more exciting, Irish-style footwork and more flair. The Celtic theme doesn’t come to life until the step sequence at the end. And the Chopin LP is lovely, but bland. The choreography doesn’t sing, and there aren’t many memorable moments. T/M perform it with elegance, but I’d like to see them bring more intensity and passion. Tarasova/Morozov have 2 weeks until their next Grand Prix. I hope they can fine-tune and improve the programs a bit before then, and generally gets tronger. With their silver at Skate Canada, they have a great shot at making the Grand Prix Final. But they’ll need to perform better at TEB. Kirsten/Mike earned a surprise bronze medal, rebounding from a disappointing showing at U.S. International Classic earlier in the season. They had a solid performance in the short program. Their SBS 3Ts were well synchronized and had good runout. Their death spiral was particularly strong, with a good low position from Kirsten. All of their elements earned positive GOE except the twist, and I thought they did a nice job capturing the bluesy rhythm of the music (“If I Can’t Have You” by Etta James). They placed 3rd. Kirsten/Mike’s long program to Romeo & Juliet was a bit up-and-down. Their first lift failed and received no points; their triple twist was only level 1 and got negative marks. However, their jump elements were pretty strong. Their SBS 3T/2T/2T combo was right on, and the throw jumps were pretty good. Mike’s carrying position in lifts has improved from last season, although he still leans forward a bit too much. The closing death spiral was, again, a highlight. Their Romeo & Juliet program isn’t very distinctive, but they performed it much better than at U.S. Classic and with more chemistry. They placed 3rd LP/overall. Marissa/Mervin’s Grand Prix debut in Lethbridge followed the same pattern set in their early-season events: Strong programs overall, compromised by weak jump elements. Can they get the jumps under control? Their Summertime SP included a very good throw 3S and nice group 4 lift. Their step sequence, the highlight of the program, earned level 3 and +1s/+2s. However, Mervin stumbled out of the SBS 3S, and their triple twist was a little crashy. They were 4th. Marissa/Mervin’s Journey LP was actually quite strong … except for those darn jumps! The opening triple twist was high and got positive GOE. Their lifts have improved a great deal since the early season; they were all level 4 and earned a majority of +2s. Spins and death spiral were good as well. But the throw 3S was their only clean jump element. Marissa doubled the SBS 3S; Mervin spun out of the SBS 3T. Marissa/Mervin tried the throw 2A as their second throw jump at this event, two-footing it. I think it was a good strategy to switch throws; they’d been using the throw 3F, but had yet to land it successfully, despite many attempts. The throw 2A is not very commonly seen these days in high-level pairs competition, but its base value is only 0.5 less than throw 3S or throw 3T. Obviously Marissa/Mervin will need to eventually get a higher-value second throw in place. But until they can achieve that, the throw 2A is a sensible option. The good news for Mervissa is 1) They were only 1.45 points out of the bronze despite the jump mistakes, and 2) They earned +5.68 points overall in positive GOE, good for a new team. Clearly, the judges like what they’re doing and respect the quality of their elements, as shown by the positive GOE. I’m just hoping the jumps will start to come together for this talented pair. Vera had an injury this fall. As a result, Bazarova/Deputat missed their early-season event, Mordovian Ornament, and looked tentative and not fully competition-ready in Lethbridge. Their Chopin No. 2 short program was very elegant, but marred by technical errors. The opening SBS 3Ts were downgraded, and the landing on the throw 3Lp was hesitant. The triple twist had very little height, and Andrei barely caught Vera in time. They placed 5th. Their long program is a medley of Beatles music from The White Album and Abbey Road. It’s a big departure for Vera, who always skated to classical warhorses with her previous partner, Yuri Larionov. The music cuts feel more coherent than in most Beatles programs; there’s not too many songs, and the songs are all late-era Beatles, so they have a similar sound. I like this program for Vera/Andrei, but unfortunately their skating was so tentative that it was difficult to really appreciate the program. They popped both SBS jumps, fell on the throw 3F, and almost had to put a hand down on throw 3Lp. The twist was again very low. The only upside was their lifts, which look much stronger this year. All 3 lifts gained level 4 and positive marks. Vera/Andrei finished 6th LP/5th overall. They now have a 4-week break before NHK Trophy. Hopefully they can get in better condition by then. The Austrian team had a poor short program, but came back a bit in the LP. Side-by-side triple Lutzes from Ziegler/Kiefer! Ziegler/Kiefer’s short program is set to Bjork’s quirky song “It’s Oh So Quiet.” The choreography is either whimsical or cutesy, depending on your taste. (I find it whimsical and amusing.) But it’s the kind of program that can only work if it’s executed well, and Ziegler/Kiefer weren’t able to do so. Miriam had a disruptive fall out of the throw 3F, the twist was very low, and the death spiral not good. They were a distant 7th. Things improved a bit in their Moulin Rouge long program.They landed SBS 3Lz (hand down from Severin) and a good SBS 3T/2T/2T combo. Their SBS spins were quite nice and well-synchronized, and the death spiral was improved. However, there were errors on both throw jumps. And they need a lot of work on their lifts, which are slow and lacking in ice coverage. Ziegler/Kiefer are in an interesting place right now. It was great to see them land the SBS 3Lz. This big element helped keep their base value high, and they pulled up to 5th LP/6th overall. Yet they had overall negative GOE (-6.12) for their elements in this competition, which is not good. Now in their third season, I’d like to see Miriam/Severin progress a bit faster than they are currently. Right now they’re training in Germany under Knut Schubert; he did not accompany them to Skate Canada. I have to wonder if they might benefit from a move to a higher-level coaching/training environment. It was not a great event for the Canadian team. They had quite a few mistakes and placed last in both segments. They lost 4 points in their Por Una Cabeza SP when Vanessa singled the SBS 3T. There were also problems on the throw 3S. They landed some elements in their Don Juan de Marco LP, but there were also a lot of errors here and there. Like Ziegler/Kiefer, they had negative GOE overall for the competition (-6.31 points). I actually like this team’s programs, and I feel they have some chemistry. But their elements right now are just not clean enough to be competitive. Valentina/Ondrej were expected to medal, but had an uncharacteristically weak performance in the SP on Friday and placed 6th. The next day they withdrew from the competition, announcing that Ondrej had suffered an accident in practice on Thursday and had later been diagnosed with a concussion. Currently, Marchei/Hotarek are scheduled to compete in 3 weeks at Rostelecom Cup. We’ll have to see if Ondrej has recovered by then. Best wishes for him to feel better soon! There was also a Challenger Series event this weekend: Ice Challenge in Graz, Austria. Fresh off their silver medal at Skate America, Alexa Scimeca/Chris Knierim won gold by a margin of 33+ points. They continued to have some trouble with SBS jumps, but their throws, lift, and twist looked stronger than at Skate America. They now have a 4-week break to prepare for NHK Trophy. American pair Jessica Calalang/Zach Sidhu also competed at Ice Challenge. This was Jessica/Zach’s first competition back since Zach had hip labrum surgery after U.S. Nationals. They looked in fairly good form, all things considered, and it was great to see them again. Calalang/Sidhu will also appear at NHK Trophy. Vartmann/Blommaert of Germany and Della Monica/Guarise of Italy also skated in Graz. Both teams had a mix of good elements and misses in their long programs and placed 2nd/3rd respectively. The Grand Prix series continues next week with Cup of China, and I’m really looking forward to seeing Yu/Jin for the first time this season. Last year, the Chinese pairs had very strong performances at this event, presaging their ultimate 2-3-4 placement at Worlds, and I’m hoping for more of the same this year. There are a number of other strong pairs in the lineup as well: Iliushechkina/Moscovitch, Kavaguti/Smirnov, and Astakhova/Rogonov. It should be a good event!